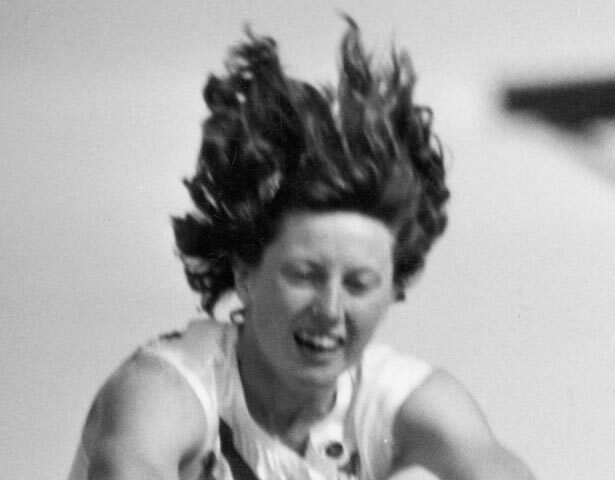 The sports writer Peter Heidenstrom rated Yvette Williams as his 'New Zealand Athlete of the Century'. There is no doubt that she was one of our greatest-ever athletes - and probably the most versatile. There were few events for women in track and field in the 1950s but Williams excelled at most of them. Yvette Williams was born and bred in Dunedin. She played several sports while at Otago Girls' High School, playing for the school's top netball team and later representing Otago and the South Island. She turned to (indoor) basketball after developing shin soreness and was a member of the Otago team that won the National Championship. She also represented the South Island and New Zealand at basketball. Williams developed her interest in athletics after a work colleague took her to the Otago Ladies Amateur Athletics Club one evening. Though she would become known as a long jumper, her first national title was for the shot put in 1947. Williams progressed as a long jumper over the next two years, attending a pilot New Zealand coaching school in Timaru. She won her first national long jump title in 1948. Realising she needed expert help to improve her training and technique, Williams turned to athletics coach Jim Bellwood. Under 'Mr Bellwood' (as Williams always referred to him), she perfected her hitch-kick, a technique developed by American athlete Jesse Owens. She won the long jump at the Empire Games in Auckland in 1950 and came second in the javelin. In the lead up to the Helsinki Olympics, Williams followed Bellwood and his wife to Auckland, boarding with an aunt and uncle in Devonport. Her routine involved an hour of early morning callisthenics in a spare room her uncle set up as a gym. Following breakfast, she went to work in the city as a secretary at the firm Hughes and Cossar. She would spend her lunch time running up and down hills to build strength in her legs. When she finished work at 5 p.m., she would meet Bellwood for another three hours' training, with hurdling, discus and shot put ‘to vary the routine'. The training paid off. On 23 July 1952 Williams became the first New Zealand woman to win an Olympic medal when she leapt 6.24 metres - an Olympic record - to win the long jump at the Helsinki games. She went on to break the world record at an athletics meeting in Gisborne on 20 February 1954. Williams' new world record of 6.29 m stood for 18 months. When it came time to select a team for the Empire and Commonwealth Games (the first with the new title) in Vancouver in 1954, Williams was at the top of the selectors' list. She won gold in the discus and long jump, setting Games records in both events. She also won the shot put and made the final of the 80-m hurdles. Williams retired from competition in 1956. By that time she was married to national basketball and softball representative Buddy Corlett. She raised four children while teaching physical education in Auckland. She coached athletics and became involved with Special Olympians - people with intellectual disabilities. Yvette Williams was named New Zealand 'Sportsman of the Year' in 1950 and 1952 and was made an MBE in 1953. She was one of the first inductees into the New Zealand Sports Hall of Fame in 1990 and in 2000 was voted Otago Sportsperson of the Century. Also in 2000, she was selected as the top New Zealand sportsperson of the 1950s, as part of a quest to find the New Zealand sportsperson of the 20th century. We have 2 events in history, 7 biographies, 7 articles, 1 comment related to Yvette Williams.